This feature might seem somewhat unsettling to longtime iMac power users: El Capitan enables you to automatically hide the menu bar, just as the Dock’s auto-hide functionality does. Why is this unnerving? It’s because the menu bar has been a rock-solid part of OS X since the very first version (called Cheetah, which was introduced way back in 2001), and power users just expect it to be there! However, the idea behind a hidden menu bar is the same as the idea behind the hidden Dock: You gain additional screen real estate for your applications, which can make a significant difference within Photoshop and Word. “But, isn’t the menu bar technically ‘hidden’ in full-screen view?” Yes, dear reader; that is true, but full-screen view is a special case. 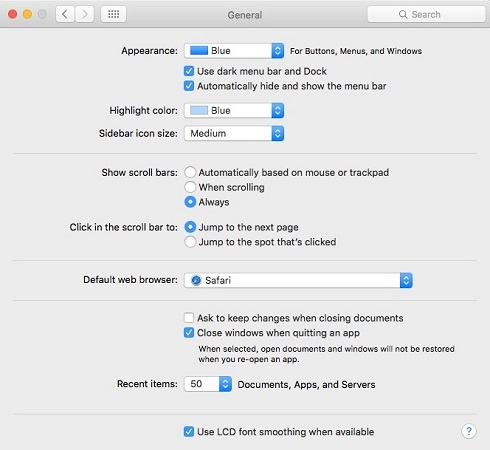 In El Capitan, you can banish the menu bar from your Desktop, which is a completely different kettle of fish! To hide the menu bar on your iMac, click the System Preferences icon on the Dock, click the General icon, and click the Automatically Hide and Show the Menu Bar check box to enable it. You can auto-hide the menu bar in El Capitan…scandalous! To display your menu bar at any time, just bump the top of your screen with your pointer. As soon as the pointer moves away from the menu bar, it scurries away until you need it again.